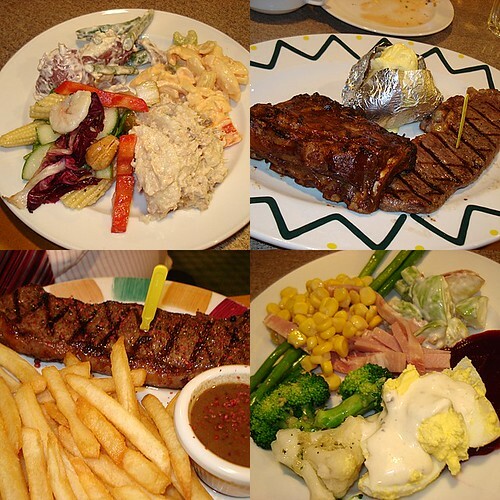 Sizzler's salad bar and steaks, originally uploaded by Camemberu. Sizzler has never been great. It still isn't. Their mains especially - our steaks were overdone and the ribs were dry. But the salad bar may have improved a wee bit compared to many years ago (the last time I visited!). You get about a dozen pre-mixed salads which are surprisingly edible. The section that looks scaled down is the DIY salad section - perhaps it's the compact layout but it does seem like there are less ingredients for you to play with. 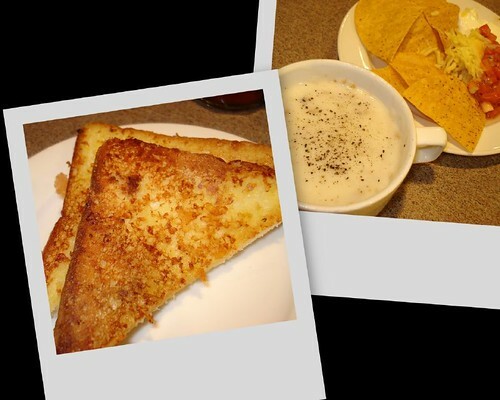 Some nice appetiser toast; all the soup and nachos you can eat, originally uploaded by Camemberu. I liked their starter toast (can't remember if it was garlic though) and the free-flow nachos, salsa and cheese - possibly hungry in the beginning. You also get three soups (two creamy and one clear), two noodles (one spaghetti, one Asian), some munchies (vegetable crackers) and various toppings, with the salad bar. The mains cost nearly $30++ with the salad buffet included. I hear prices are a bit better at lunchtime. The salad bar alone is about $16.90++, which is probably what I would do if I ever do go back again. If.